I once knew a medical professional who told me that sites like WebMD had become the bane of her existence—or of her professional life, any way. She worked at a walk-in clinic, and said that, most days, there’s not an hour that goes by when a patient doesn’t venture into her office with a self-diagnosed—and often self-medicated—malady. Certainly, medical websites and information hubs can enable the hypochondriacs among us, and that is no doubt a source of frustration for medical professionals. Nevertheless, there is something to the idea that the Web can be an actually helpful source of guidance and medical insight. Make no mistake about it: Google is not a physician, and there is no online algorithm smart enough to diagnose a patient with any kind of precision. With that said, patients can use the Web to obtain general information about their health and wellbeing, and medical practices can use the Internet to reach out to their patients and prospective patients, ultimately establishing themselves as authorities and as trusted providers of medical care. Is content marketing really an important concern for medical practices? Just consider this question: If you move to a new town, or suddenly face the need to see a medical specialist, how are you going to go about locating the best caregiver? Increasingly, search engine results are replacing traditional word-of-mouth recommendations, meaning that the doctors who are the most visible (and the most authoritative) on Google are the ones who are going to draw the most patients into their offices. What this means is that creating and distributing useful content—the kind of content that catches the eye of readers, offers actionable insights, and therefore wins the favor of Google—is essential for marketing any medical practice. But how can medical practices create blog and social media content that is helpful without falling pray to the hypochondriac-enabling WebMD syndrome? A few tips follow. First and foremost, remember what you’re setting out to do. Your goal is not to diagnose anyone, but rather to establish yourself as someone who is knowledgeable, authoritative, and, above all, here to help. Thus, the best content to share might be more general content about diet, fitness, health, oral hygiene tips, heart health strategies, or whatever else fits in with your particular practice. The content that readers love most is content that is actionable. Sharing an obscure study or new drug research report—something that is really only interesting to other doctors—will have limited impact on your content marketing strategy. By contrast, offering 6 Ways to Increase Your Fiber Intake, or 5 Benefits of Cardiovascular Exercise, will surely win the attention of patients and potential patients! Keep it positive. 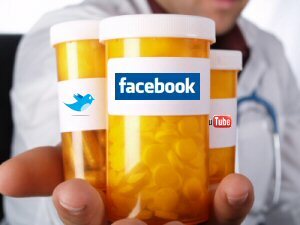 Nobody wants to follow the Facebook page or blog of a medical practice that is constantly telling them they may have some dire disease. Posting helpful updates about virus outbreaks is one thing, but fear-mongering ultimately becomes counter-productive. Make it plain that your goal is to help people stay healthy, not just to scare them! Finally, remember not to make your content too “salesy.” Yes, you want to interest people in your practice, but do so by projecting your knowledge and authority, not by trying to sell readers on particular procedures or treatments! Content marketing is increasingly imperative for building buzz, engaging consumers (and patients), and developing a strong online brand—and this is as true for medical and dental practices as it is for any other small business.